After visiting the yard in Xiamen, we stayed two nights in Hong Kong. We spent most of the time within sight of Victoria Harbour (map of area). The harbor separates Kowloon Peninsula on the north from Hong Kong on the south. 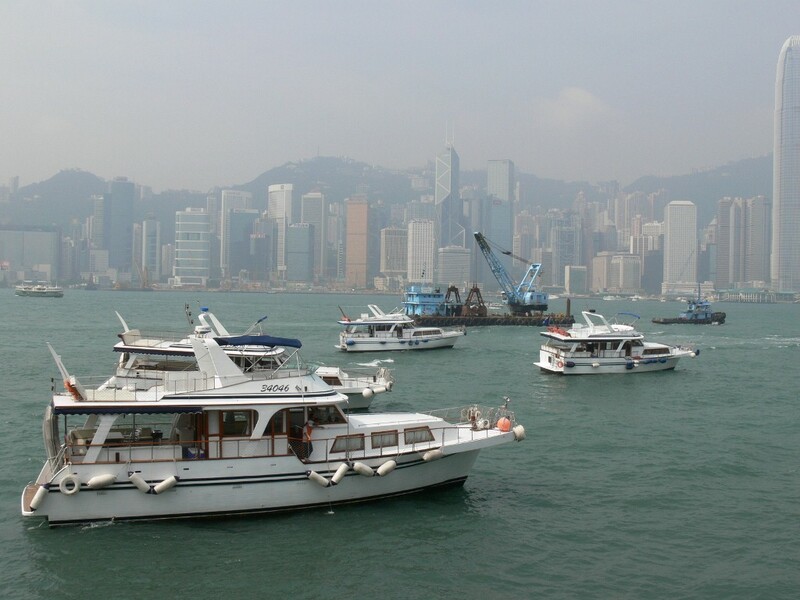 The waters are constantly busy with boat traffic of all kinds, ranging from ferries, tour boats, high-speed catamarans, and cruise ships to tugs, and all manner of commercial boats. We enjoyed our stay at the Nikko Hotel on the Kowloon side, alongside the harbor, which was within easy walking distance of the shops and restaurants in Kowloon. Fodor's Hong Kong was a useful reference and source of ideas, although a little lacking in detailed directions. The tourist map we got from the hotel filled in any gaps. 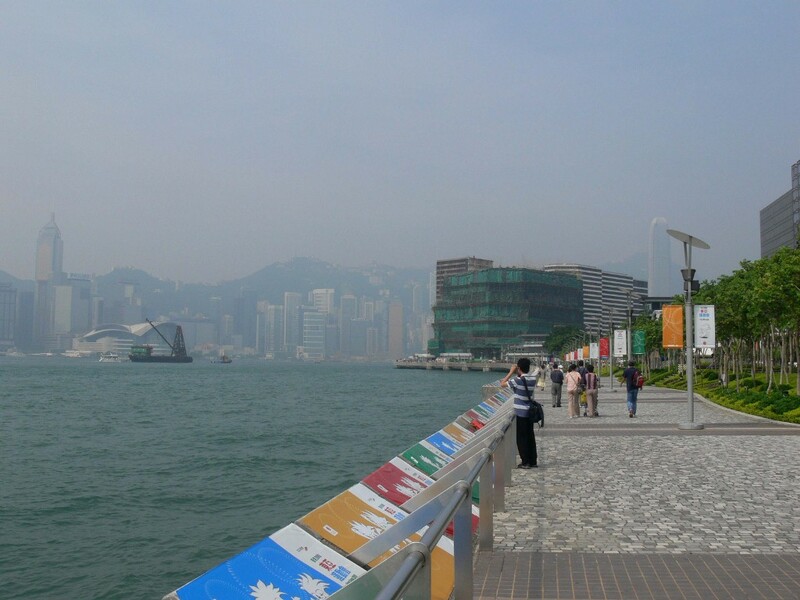 Tsim Sha Tsui Promenade runs along the Victoria Harbor waterfront from near our hotel. Part of the promenade, Avenue of Stars, celebrates Hong Kong's film industry. 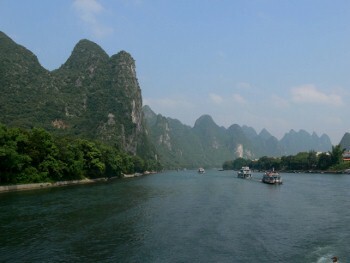 The walkway is reasonably crowded in this morning picture, but at night the crowds were thick. High temperature areas like Hong Kong really come alive at night when when the weather is a little cooler. It's not much cooler at night though--the low & high temperatures the first full day we were there were 83F & 94F, with relative humidity ranging from 57 to 88%. Well-fendered tour boat like these picked up groups along the Kowloon breakwater throughout the day. The harbor has a constant chop, and getting the boats close enough to the breakwater without pounding them to pieces appeared to be a real challenge (video). Each captain approached slowly, and carefully adjusted position until their boat was up against a gap. Most had a small female crewmember who worked from the bow with a long boat hook, either fending off or hooking on. Once the boat was alongside, people just hopped on, carrying food, drinks, and even small children. It all looked rather unsafe, but nobody seemed particularly concerned. 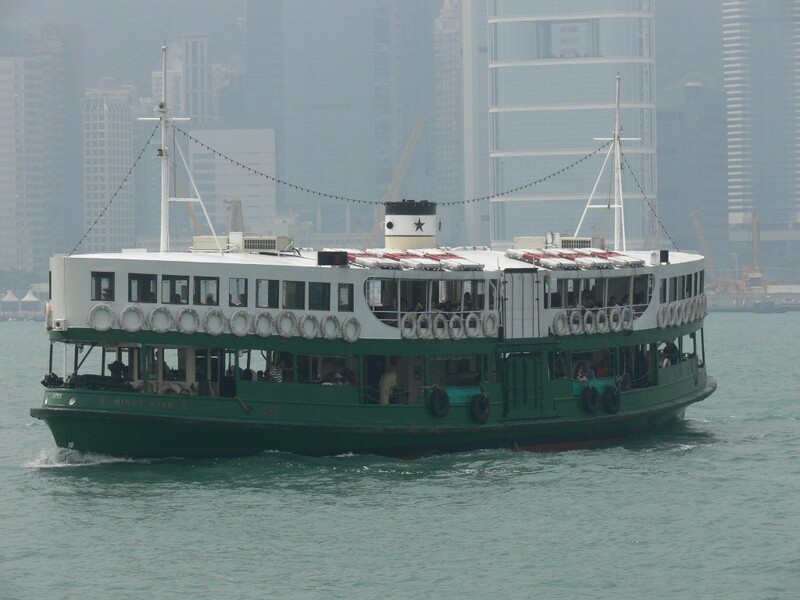 You pretty much have to ride a Star Ferry across the harbor--the company has been operating a ferry service between Kowloon and Kong Hong since the late 1800s. We purchased a day pass, but it turned out to work only their Harbour Tour boat and didn't include the standard cross-harbor ferries. This worked out ok, as we had wanted to take a night harbor tour anyway, particularly to see the show A Symphony of Lights. And the dramatically lit skyscrapers that surround the harbor are a show themselves. We brought takeout food with us and rode two night tours in a row. 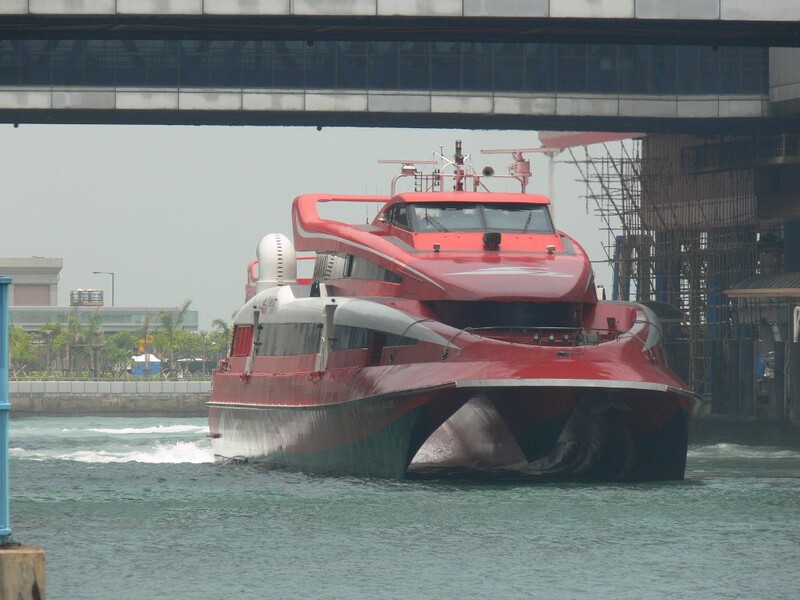 On the Hong Kong side, companies such as CotaiJet, TurboJet, and First Ferry operate high-speed catamarans to the gambling mecca of Macau. It's incredibly popular. Ferries run 24 hours a day, leaving about every 15 minutes between 7am and midnight. On our way to The Peak, we took the escalators up to mid-level (you instead can take a free shuttle to the peak tram from the Central ferry terminal). The series of escalators and walkways run up for a half mile and are billed as the world's longest. We got great views into the city and found lots of interesting bars and restaurants near the top in SoHo (short for "South of Hollywood Road"). 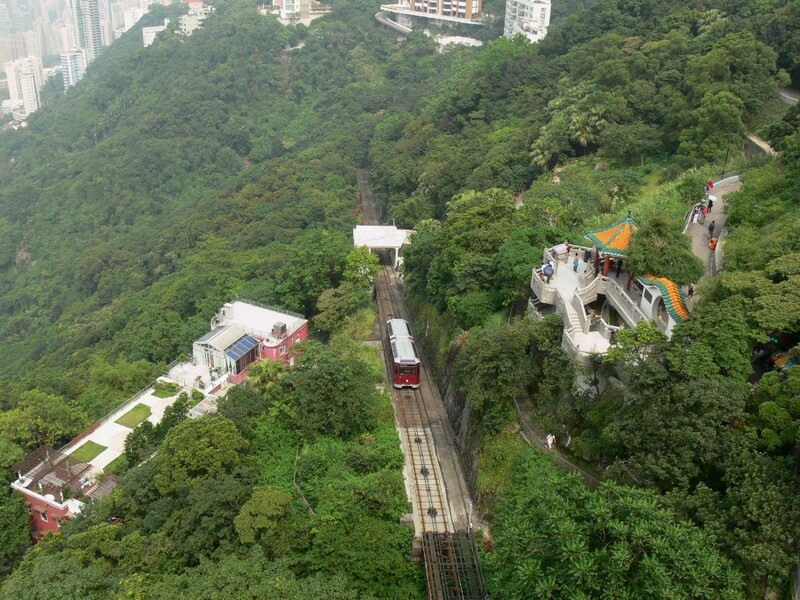 From the top of the escalators, we walked through the Hong Kong Zoological and Botanical Gardens on our way to the the Peak Tram terminal. 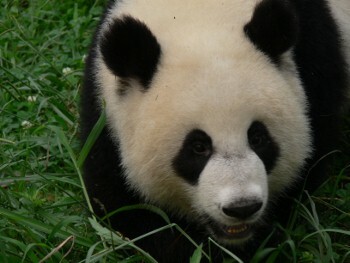 Several endangered species are houses here, including Black and White Rufted Lemurs and Ringtailed Lemurs. The Peak Tram has operated commercially since 1888, and for many years was the only way to reach the top other than a sedan chair. The tramway runs nearly a mile from 95 feet above sea level to the Peak Tower at 4,478 feet above see level. The views from the top are amazing, even when the weather is somewhat hazy. 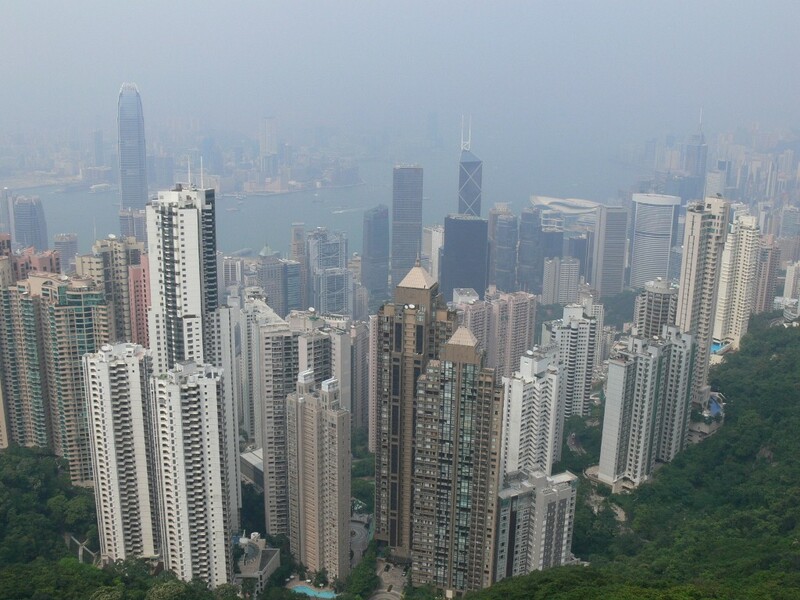 This is looking northeast, over the skyscrapers of Hong Kong and across Victoria Harbour towards Kowloon. From The Peak, we could see masses of commercial boats moored along the west shore of Kowloon, so on our second day we went over to check them out. 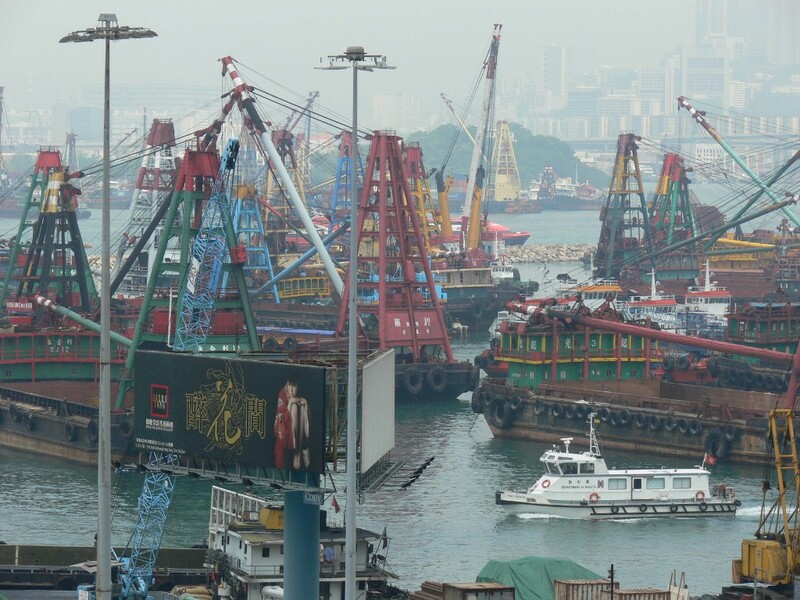 Hundreds of boats were packed in behind what turned out to be a large typhoon shelter. Nearby was a massive complex including residences, hotels, and a major new mall, Elements, with over 1 million square feet of retail space. It even had an indoor skating rink. We came across 24 Lamborghinis parked outside at one of the hotels. 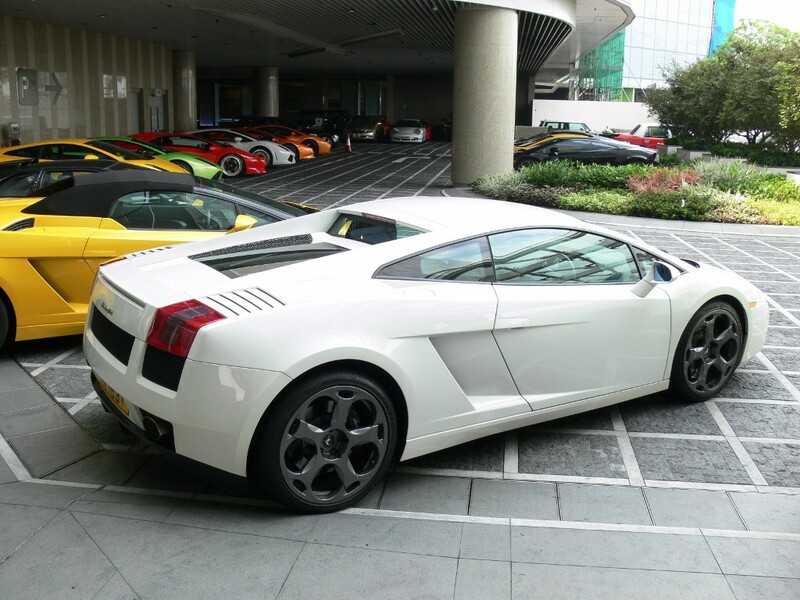 It was a meeting of the Hong Kong Lamborghini club. The cars looked amazing, and most were quite new. As a mechanic specializing in exotic Italian cars, James used to work on Lamborghinis, but had never seen so many in one place.